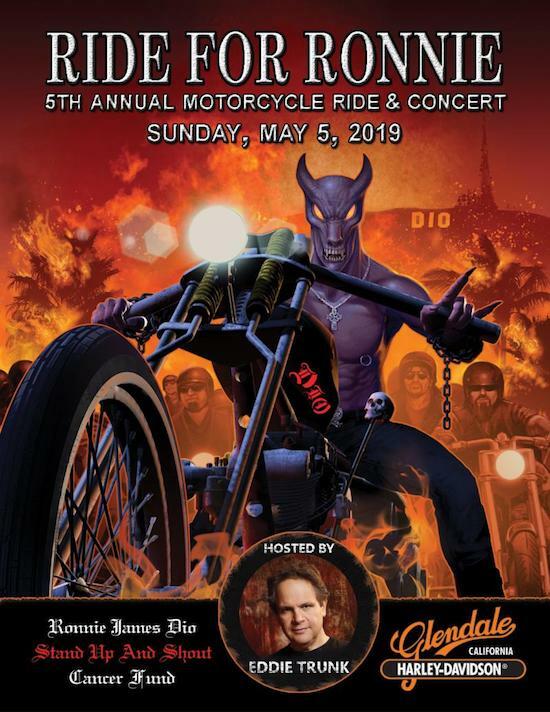 The 5th Annual Ride For Ronnie Motorcycle Ride and Concert will take place on May 5th benefiting the Ronnie James Dio Stand Up and Shout Cancer Fund. Comprised of a Motorcycle Ride originating at Harley-Davidson of Glendale and culminating with a concert at Los Encinos Park in Encino, the Ride For Ronnie will raise awareness and funds for cancer prevention and research for a cure. The concert will once again be hosted by radio and television personality Eddie Trunk who is also curating Eddie Trunk’s All Star Band–a group of stellar rock musicians selected to headline the afternoon of live music. Last year’s Ride brought in over $50,000 for the Dio Cancer Fund (www.diocancerfund.org). Riders will assemble for a continental breakfast at Harley-Davidson of Glendale with kickstands up at 11:00AM. The Ride will take them around the northern edge of the San Fernando Valley to Los Encinos Park in Encino, where they will be treated to music, a raffle, silent and live auctions, food trucks and much more. Kicking off the afternoon of live music at the Park will be the popular Dio cover band DIA (https://www.facebook.com/pg/DIAtribute/about/?ref=page_internal). They will be followed by LA rock band Budderside (http://budderside.com), Petty Cash, presenting the music of Tom Petty and Johnny Cash (https://www.facebook.com/PettyCashParty) and megarock band DC4 (http://artistecard.com/DC4). Participants in Eddie Trunk’s All Star Band will be announced shortly. As always, a silent auction booth will have many amazing items available to bid on throughout the afternoon, while live auctions, featuring one-of-a-kind rock collectibles, will be held from the stage between artist performances.